Baked Asparagus Fries are a healthier alternative to regular fries. 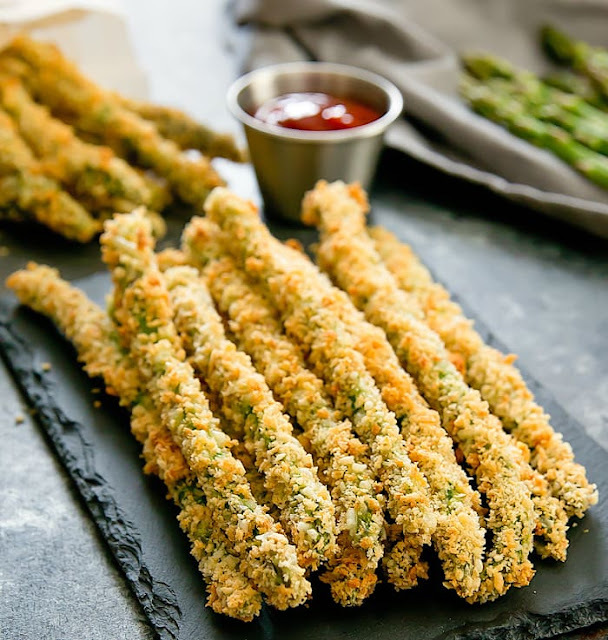 Asparagus stalks are coated in panko bread crumbs and parmesan cheese and baked until crispy. Asparagus, in particular, make great fries. They have the perfect shape and size and they hold up well too. I think this is my new favorite way to eat asparagus.!! Asparagus coated in panko and parmesan cheese and baked until crispy is a healthier alternative to regular fries. Preheat oven to 375°F. Line a three-quarter baking sheet with parchment paper. Spread panko crumbs evenly across the lined baking sheet, keeping your panko crumbs to a thin layer. Spray panko crumbs surface with cooking oil spray. Bake panko crumbs for about 5 minutes or until golden. Remove from oven and let cool. Turn oven heat to 425°F. Once bread crumbs are cooled, mix in 1/2 cup parmesan cheese while panko remains on the pan. Then spread out mixture evenly across baking sheet again. Line a separate three quarter baking sheet with parchment paper. In a container long enough to fit asparagus, pour in whisked eggs. I used an 8-inch loaf pan. In a separate container long enough to fit asparagus, pour in flour. Coat asparagus lightly in egg. Shake off excess egg and then lightly coat asparagus in flour. Tap asparagus a few times against container to shake off excess flour. Coat asparagus in egg again and shake off excess egg. Make sure that you thoroughly shake off any excess egg drippings before rolling in panko because the panko will not stick if it gets too moist. Place asparagus in panko mixture and press panko crumbs onto the asparagus. 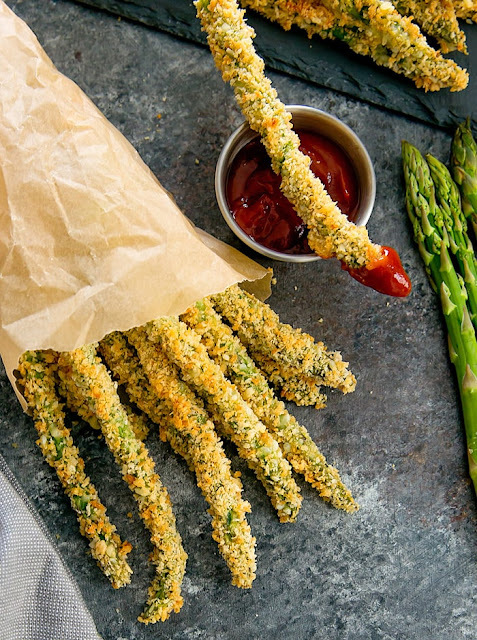 Avoid trying to roll the asparagus across all of the panko crumbs because it will cause many of the crumbs to get too moist and they won't stick to the asparagus. Keeping the panko spread out on the sheet rather than having them in one container should help keep most of them from getting too moist. Set coated asparagus aside on empty lined baking sheet. Repeat until all asparagus is used up. Bake for 10-12 minutes at 425°F, or until asparagus is cooked and the outside coating is crispy. Serve with your favorite dipping sauce.